A lovely walk through plantation and heath to the remains of the Corrantee Lead mines and beyond. 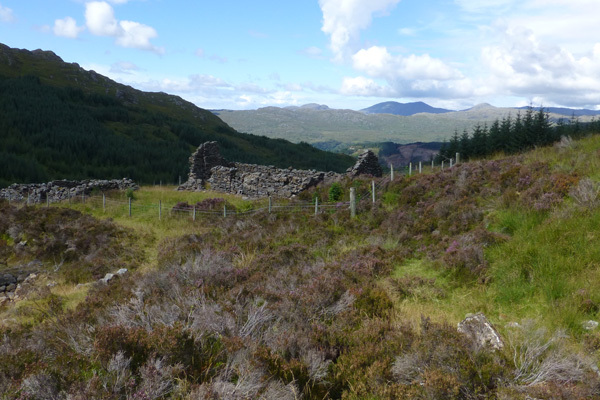 The route follows a watercourse for some of its way and affords some spectacular views of the surrounding hills of Ardnamurchan, Sunart, Moidart and Morvern. A great walk for views and wildlife and a sense of wilderness. 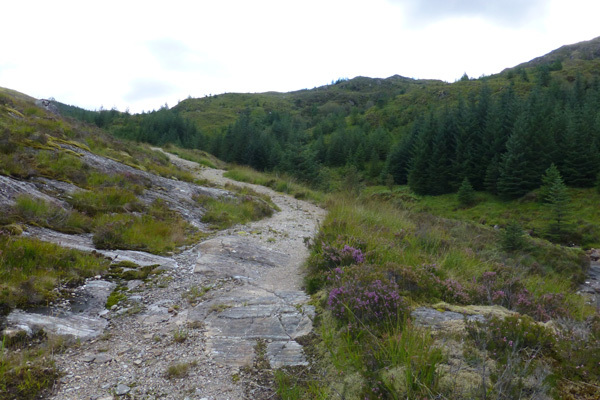 The walk follows a coffin route along which the dead were taken to Green Isle on Loch Shiel. It was later used as an access route to the Corrantee Lead Mine in the 18th and 19th century. 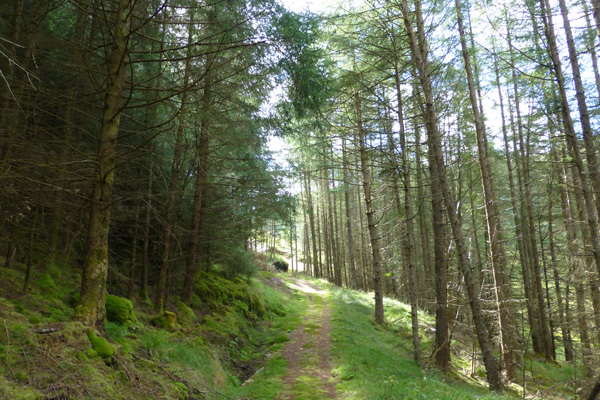 The walk initially passes through some lovely sections of Sitka spruce and larch plantations. The verges support an assemblage of bryophytes (including species of Polytrichium, Hypnum, Sphagnum and Thuidium tamariscinium) with heather (Calluna vulgaris), bell heather (Erica cinerea), bilberry (Vaccinium myrtillus), St Johns-wort, tormentil (Potentilla erecta), self heal (Prunella vulgaris) broom (Cytisus scoparius), wood sorrel (Oxalis acetosella), purple moor grass (Molinia caerulea) and hard fern (Blechnum spicant) evident on route. In the open moorland above, the vegetation is dominated by heather and purple moor grass, with cross-leaved bell heather (Erica tetralix), bog asphodel (Narthecium ossifragum), bog myrtle (Myrica gale), devils’ bit scabious (Succisa pratensis) and various species of Carex and Juncus associated with the wetter areas. The heath is particularly lovely in late summer when the heather is in full bloom. This section of the walk provides a real sense of wilderness. Beyond the lead mine, the heath becomes noticeable wetter and supports an abundance of bog asphodel, glowing gold in midsummer and bog cotton (Eriophorum spp,. There are some lovely bog pools supporting bogbean (Menyanthes trifoliate). 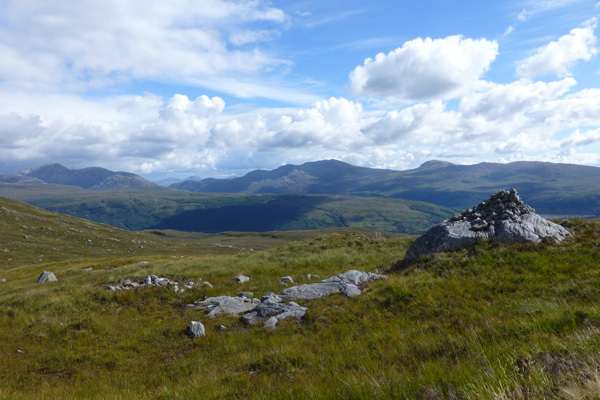 The views are particularly spectacular here, with panoramic views towards Beinn Resipole, Beinn a Chaorainn, Coire Dudh, Meall Iain and Beinn Ruighe, as well as Loch Sunart and the Morvern hills beyond. There are also some fine views of the villages of Scotstown and Strontian. 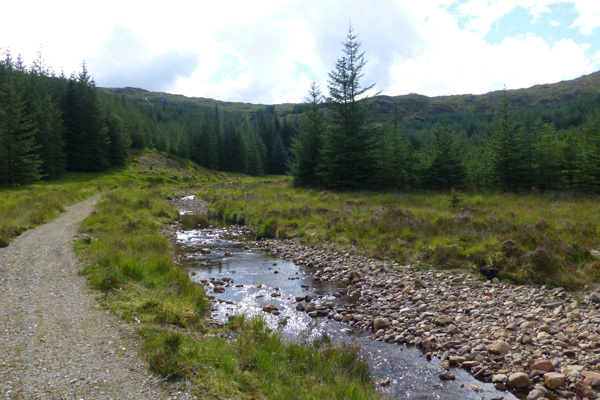 The walk follows the watercourse, Allt Coire an t-Suidhe through plantation and heath to the remains of the Corrantee Lead mines. Corrantee Lead Mine is the most westerly of the mines in Strontian. It has been used for both open cast and deep shaft mining, principally for the mineral galena used in production of lead. 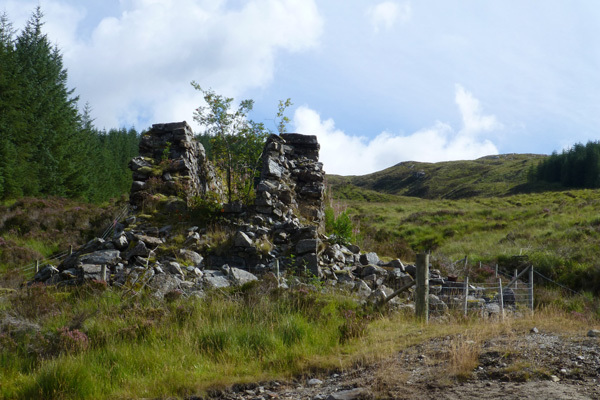 Galena was first discovered by Sir Alexandra Murray in the hills around Strontian, and he opened a mine in 1725 to exploit this valuable resource. The mine is thought to have been closed by the end of the 18th century, but may have been worked periodically up until late 20th century. The village Strontian is also famous for the discovery of another mineral, Strontium, to which it gave its name. 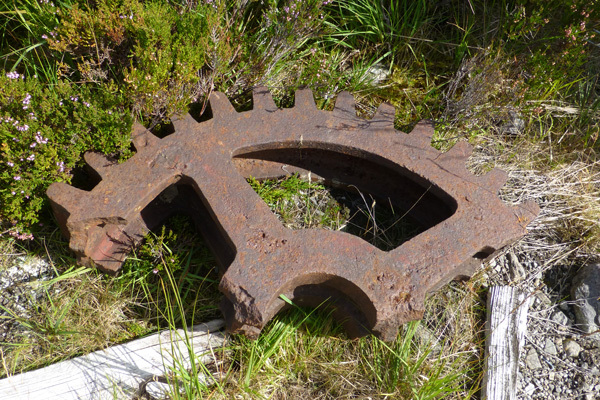 Today, the mine workings consist of the remains of a water wheel house, which originally contained a large iron water wheel that was involved in the pulverising of the mined rocks to extract the lead. The iron water wheel lie lies at the base of the stone water wheelhouse; it is to have been installed in the late 1860s. Further on there is a larger building with two fireplaces and a nearby enclosure; the latter possibly used to keep animals. The buildings are in various stages of dereliction but with enclosing walls (and gable ends of the main building) survive to give a feel for the size, shape and possible uses of the building. It is evident that the main building has been modified throughout its lifetime. The old mine opening is now blocked up and no longer evident. All the building associated with the mine are enclosed by a fence for safety reasons. 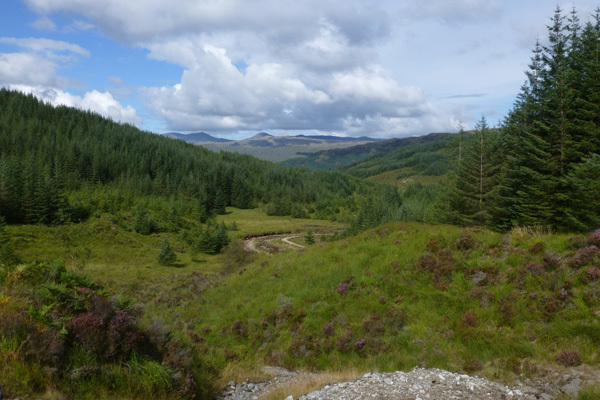 In terms of wildlife, look out for conifer specialist in the plantations and raptors (including golden eagle) along the mountain tops and ridge line. Look out for dragon flies and damsel flies by the watercourses and bog pools. Look out for the tracks and signs of pine marten and red deer on route. 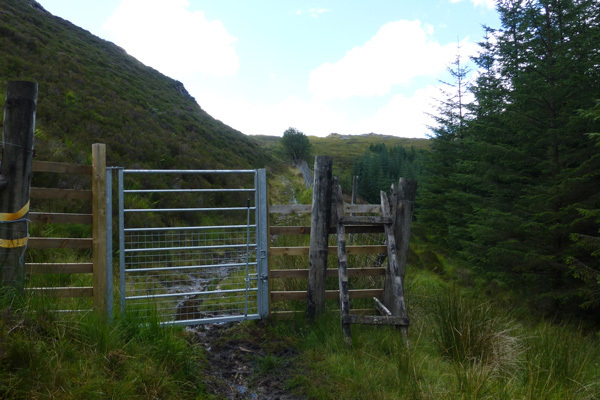 The walk start point is off the minor road to Polloch at the far end of Loch Doilet, just south of the bridge. Park in the layby opposite a green signpost to Strontian (6km). 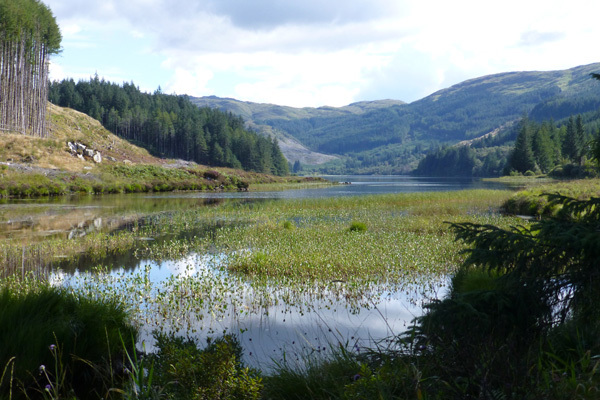 Take time before starting the walk to admire the lovely Loch Doilet, the shores of which are accessible from the layby. 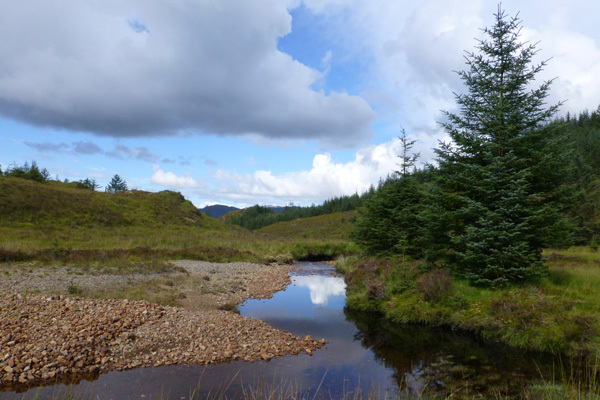 The walk is on the signmarked forest track (to Strontian) that soon starts to ascend through Sitka spruce and larch plantations, with some glimpses of the surrounding hills through gaps in the trees. There are some fairly steep sections in this part of the walk. 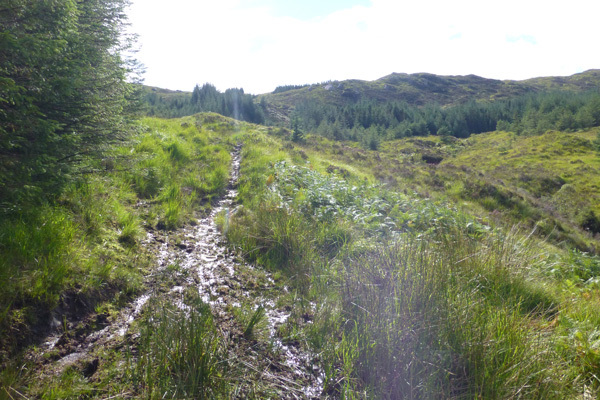 The track eventually emerges from the plantation onto open heath, with good views afforded on the right of the wooded lower slopes and crags associated with the largest Corbett on the Ardnamurchan, Ben Resipole. Soon a watercourse, Allt Coire an t-Suidhe, that has been evident in the soundscape, comes into view as it cuts through the metamorphic sedimentary rock (Granofelsic Psammite). The path begins to skirts this meandering watercourse; this is one of the most lovely sections of the walk. Eventually, the gravel path peters out and becomes very muddy faint path that ascend towards the remains of the Corrantee mine. The path is very boggy at this stage. Take time to explore the remains of water wheel house, whose iron waterwheel lies cast out below. Then continue further up by the side of the waterwheel over the heath to another larger building with a smaller building nearby, reached by crossing a small burn. 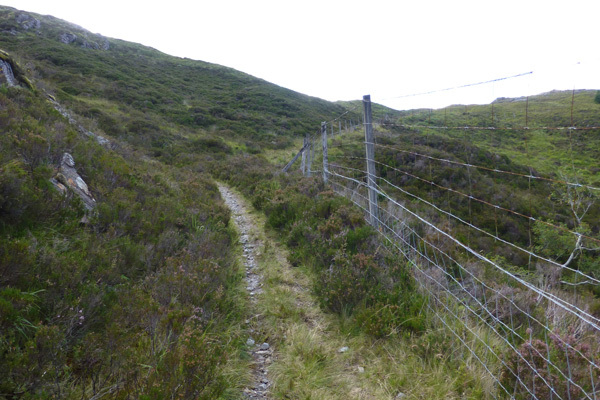 Pass through a deer gate and continue to follow the path by the fence line. Cross over another small burn before leaving the fence behind and continuing over the wet heath on a broad path. The heath becomes noticeable wetter at this stage, so take care. Head towards a cairn in the distance, beyond which is another cairn. 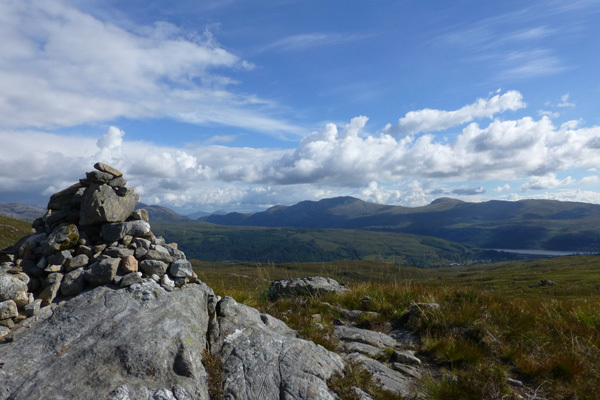 There are some spectacular panoramic mountain views at the cairns, as well as some lovely views over Loch Sunart to the hills of Morvern. There are also good views of Scotstown and Strontian. This is also a good place for a picnic or a rest. Turn back at the second cairn to retrace your steps back to Polloch. 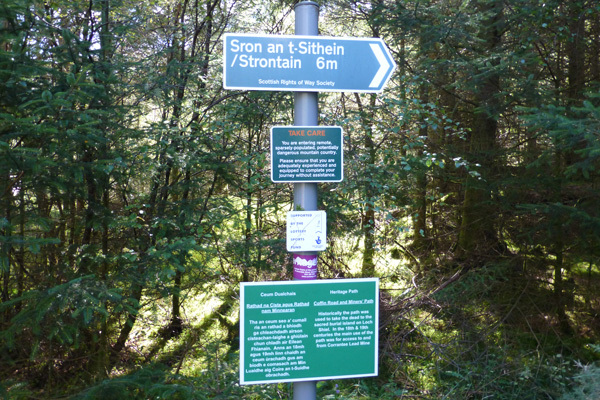 Alternatively, you can continue the walk onto Scotstown and Strontian if desired, before heading back, although this will be a much longer journey.